The police arrested four men in central England early today in connection with last week’s failed bomb attacks on London and media reports said one of the suspected bombers was among those held. A police officer guards a house in the Washwood Heath area of Birmingham, central England, as it is searched in connection with investigations into the London bombings on Wednesday. Jean Charles de Menezes wanted to be an electrician from the age of 10. The blond-haired boy would tell his mother, Maria, that it was the way he would leave behind the poverty of rural Brazil for a better life abroad. Three suspected Taliban fighters were killed and two wounded in a gunfight, which also left five policemen injured in violence-torn southern Afghanistan, a police official said today. Twentynine Pakistani women from different walks of life have been recommended for the 2005 Nobel Peace Prize. They are among the 1,000 selected on the basis of their work in their respective fields. US President George W. Bush is looking forward to his proposed visit to India next year, White House Press Secretary Scott McClellan has said. Accusing India and three other countries seeking permanent membership on the UN Security Council of using “unethical means” and financially “blackmailing” some members for support, Italy has called for an independent inquiry into the matter. Indonesian surgeons have delivered a 27-year-old baby from a middle-aged housewife who had carried the dead body inside her because she was too poor to have it removed, doctors said today. Lankan President Chandrika Kumaratunga led Sri Lanka Freedom Party has nominated Prime Minister Mahinda Rajapakse as the next presidential candidate. London’s Metropolitan police would not comment on whether a bomber had been captured, but said one of the four men arrested in the city of Birmingham was en route to the capital for questioning at a high security detention centre. Police sources said the man, detained in the Hay Mills area of Britain’s second-biggest city, was the most significant arrest. The BBC and Sky television said he was a suspected bomber. The botched bombings on July 21 occurred exactly two weeks after four suicide bombers killed 52 persons in a similar attack on London’s transport system. The police has linked the suicide bombers to Al-Qaida. The police used a teaser stun gun on the most significant suspect and a suspect package was discovered at the address, a police spokeswoman said. “The man was tapered during the operation although no firearms were discharged,” she said. A small area around the house was evacuated and a controlled explosion on the suspect package was to be carried out. The three other men were detained at another address and taken to a West Midlands police station. All arrests were made under anti-terrorism laws. 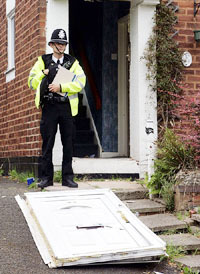 Forensic investigations were being carried out at both addresses. The police also arrested two men at a train station in the central town of Grantham as they travelled from the northern city of Newcastle towards London’s King’s Cross. The men were arrested late yesterday after a tip-off from off-duty police officers. The London police declined to comment on whether the arrests were connected with the arrests of four men in Birmingham. The police have published the photographs of the four main suspects in the July 21 attempted attacks from images captured on security cameras. Police chief Ian Blair said yesterday the investigation into the failed attempt to bomb London’s transport network was moving at an “astonishing” pace but warned that the fugitive bombers could strike again. Newspapers reported today that a prime suspect wanted for last week’s attempted London bombings had served a jail sentence for knifepoint robberies and grew to hate the British system after his conviction. Muktar Said Ibrahim, 27, wanted over an attempt to plant a bomb on a bus in last week’s failed attacks, was jailed for 5 years in 1996 for mugging people when he was part of a teenage gang, the Daily Telegraph said. The Sun tabloid said Ibrahim arrived in Britain from the East African country of Eritrea in 1992. Newspapers said Ibrahim and another of the four suspected bombers came to Britain as child refugees from East Africa and had received state welfare payments. The Home Office (interior ministry) and the police declined to comment on the reports. Yesterday, the police said they had found possible material for making explosives at a flat in north London linked to one of four suspects. The police were checking comments by a neighbour that at least one of the suspects might have returned to the flat in north London the day after the attempted bombings. A police source, who declined to be identified, said the information could be “extremely interesting” but that officers had not yet confirmed the report. He left the isolated farm that he grew up in at the age of 14 to pursue his studies, living with an uncle in an impoverished area of the sprawling city of Sao Paulo. By the time he was 18, Jean Charles had overcome the odds to complete his professional diploma. It was the piece of paper that would allow him swap a life of odd jobs in the crime-ridden ghettos of Sao Paulo for a home in London. After travelling to Britain on holiday, during which he may have worked illegally, he obtained a five-year residency permit. Such was his desire to make the most of the opportunity, the Brazilian had mastered English within four months of his arrival in Tulse Hill, south London, in March 2002. He quickly adapted to British life. To relax, the 27-year-old would watch television - a favourite programme was EastEnders - or hang out with friends in a Brazilian bar close to Oxford Street. He told relatives his dream was to build a successful career and earn enough money to return to the family home near the city of Gonzaga, in Minas Gerais, south-east Brazil, and set up a company. In his thrice-weekly phone calls home, he told his mother he was safe and a happy in London - that the police did not even carry guns. Three days ago, shortly before 10 a.m., his modest ambition was terminated some 7,000 miles from home by a burst of 9 mm bullets from a Glock 17 pistol fired into his jaw and mouth at point-blank range by an officer from a Scotland Yard anti-terrorist unit. By a catastrophic coincidence, he was followed from his home and then pursued into a Tube carriage by plain-clothes police officers who suspected he was a suicide bomber. His fate was apparently decided by a cruel combination of improbability: that, used to the heat of Brazil, he should find a cool English summer's day too cold for dispense with wearing a bulky jacket. Secondly, his skin colour might make him appear Asian to his pursuers. Thirdly he shared a communal entrance to a block of flats with a suspected member of the terrorist cell that carried out last Thursday’s failed attack on London's transport system. His mother, Maria, told The Independent from the family home: ‘‘He was a worker. He was my life. I’m begging that the police be punished. It’s not fair to kill an innocent worker. I told him to take care with the violence in England. Jack Straw, the Foreign Secretary, and Sir Ian Blair, the Commissioner of the Metropolitan Police, expressed their ‘‘deep regret’’ for the young man’s death but insisted a shoot- to-kill policy for suspected suicide bombers would remain in place. Mr Pereira, 27, from Norbury, south London, disputed the account of Scotland Yard that Jean Charles was challenged by the pursuing plain-clothes police officers as he stepped off a No. 2 bus at Stockwell Tube station, about two miles from his flat. The fight erupted late yesterday in Shah Joy district of the Zabul province, on a main highway between the capital Kabul and the former Taliban stronghold of Kandahar province, local police commander Qauoom Jan said. Purported Taliban spokesman Mullah Abdul Latif Hakimi, calling AFP from an unknown location, said 45 insurgents had initiated the hour-long gunfight and added that none of their fighters was killed and only one was wounded. “Only one of our mujahedin (Islamic holy warriors) was wounded,” he said. Taliban loyalists have stepped up their attacks on US and government forces in recent months after a winter lull in fighting and ahead of scheduled September parliamentary elections. US and Afghan troops killed dozens of militants in an attack on an insurgent hideout yesterday in neighbouring Uruzgan province, according to provincial officials. South Asia is represented by 157 women, including 91 from India, Kamla Bhasin, a New Delhi-based Coordinator for South Asia, working to identify the women activists, told reporters in Lahore today. Pakistan Foreign Minister Khurshid Kasuri has expressed the hope that the legislation that the US Congress has to pass to make operational the Bush administration’s defence and nuclear cooperation agreements with India would be ‘‘non-discriminatory’’. According to a foreign office statement, Mr Kasuri was talking to a six-member media delegation from Sri Lanka, which met him in his office here on Tuesday. Pakistan’s nuclear capability, the Foreign Minister said, was defensive and based on the minimum credible nuclear deterrence which would be maintained. “Pakistan’s nuclear programme and strategic assets are secure and under a strict and multi-layered custodial control,” he added. When asked about the Iran-Pakistan-India gas pipeline project, the Foreign Minister indicated that Pakistan would go ahead with the project even without India. “India was welcome to join this project if it so wanted,” he said, alluding to the cooling of India’s enthusiasm for the project since it signed the nuclear energy cooperation agreement with the US which opposes the plan. Mr Kasuri told the Sri Lankan journalists that for durable peace in South Asia it was essential to resolve the Kashmir issue to the satisfaction of the Kashmiris as well as that of India and Pakistan. While expressing satisfaction at the volume of the two-way trade between Pakistan and Sri Lanka, he said the Free Trade Agreement signed by the two countries recently would open “a new chapter in their bilateral relations”. “I know the President looks forward to visiting India next year,” he said here yesterday. In a blistering attack, Italy’s UN envoy Marcello Spatafora said the G-4 comprising Brazil, Germany, India and Japan were “resorting to financial leverage and to financial pressures in order to induce a government to align, or not to align, itself with a certain position, or to co-sponsor or vote in favour of a certain draft”. Speaking after Canada introduced the “Uniting for Consensus” (UFC) resolution on the expansion of the Security Council last evening, Spatafora said what was at stake was the “credibility” of the organisation and of the reforms process. A team of 15 doctors operated for three hours yesterday to retrieve the 1.6-kg petrified baby from the 54-year-old woman, identified as Taminah, at the Sutomo general hospital in the Java island city of Surabaya. “This may be a world record. The woman has carried the dead but fully developed baby inside her for 27 years,” said doctor Urip Murtejo. He said the woman was otherwise healthy but had been referred to the hospital from her home of Bojenegoro, west of Surabaya, after complaining of occasional pains in her stomach. Lankan President Chandrika Kumaratunga led Sri Lanka Freedom Party (SLFP) has nominated Prime Minister Mahinda Rajapakse as the next presidential candidate. According to a top SLFP stalwart, this “unanimous decision” was taken at the 12-member party nomination committee chaired by President Kumaratunga at the Janathipathi Mandiraya last night.